Save your furniture and walls from your kitty’s claws with our complete guide that tells you how to train your cat to use a scratching post. There was a time not long ago when the generally accepted process for preserving your furniture around a cat was to have them declawed. Over the past few years, however, declawing has become a very controversial topic (for good reason), and many vets will no longer even perform the surgery. Your cat’s claws are essential for their ability to climb, and – should they ever get outside – a valuable defense against predators. While some cats come through unscathed, there can be nerve complications with their feet as a result of the procedure. Cats with claws, however need to scratch. It helps keep their claws sharp and healthy by removing dead layers from them, is great exercise, the stretching involved helps keep them limber, and it keeps them from getting bored (if you think they can be destructive now, wait until the boredom sets in and they get a little stir-crazy). This doesn’t mean, however, that you are doomed to have shredded couches and decimated carpets for the entirety of your cat-parenting life. Read on for a few tips on keeping your cat from clawing up your furniture, as well as how to train your cat to use a scratching post! There are a number of creative solutions and products on the market to keep your cat from destroying your possessions. Before spending money on any of them, you should first get a set of clippers for your cat’s claws , and get your pet used to having them handled. Keeping the claws trimmed helps keep them from getting caught on anything, which can result in serious injuries to the claws themselves, paws, limbs, or worse depending on the situation. Trimming your cat’s nails will never be a waste of time, as it can be combined with other methods to protect your furniture and floors. Use sprays to keep them away from your favorite sofa! You can buy sprays to repel your cat away from certain areas of your house – although if you’ve ever managed to get one of these sprays in your mouth, you may decide against spraying it on anything that you might accidentally come in contact with ever again. You can also get two-sided tape to apply to your furniture, so that your cat’s paws will stick to it a little as they scratch, and it may be unpleasant enough to deter them. Depending on the fabric of your couch, however, this might be damaging to the surface – and it isn’t particularly attractive if the sides and or back of your couch are visible. The most recent product I have seen is a set of caps for your pet’s nails . These are available for both cats and dogs, in multiple sizes, and in multiple designs. They slip over your pet’s claws and adhere with a nontoxic epoxy, but – having tried them myself, I learned this from experience – they do come off after not too long and have to be reapplied with some frequency, and you have to keep your cat calm and still for an extended period of time after application (that might sound easy – I didn’t find it to be). 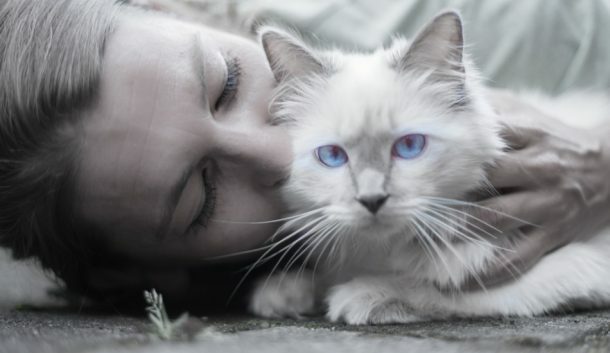 Overall, the best, easiest, and least expensive method in the long run method to minimize feline-inflicted damage is to provide your pet with a scratching post or pad. The greatest thing about scratching posts is that you can scale them to your living space, your budget, your style, and your carpentry and crafting skills. A simple piece of 4×4 attached to a small piece of plywood as a base and covered in a piece of carpet remnant is all you need – but you can make this into far more than just a post for your cat to sharpen their claws on. 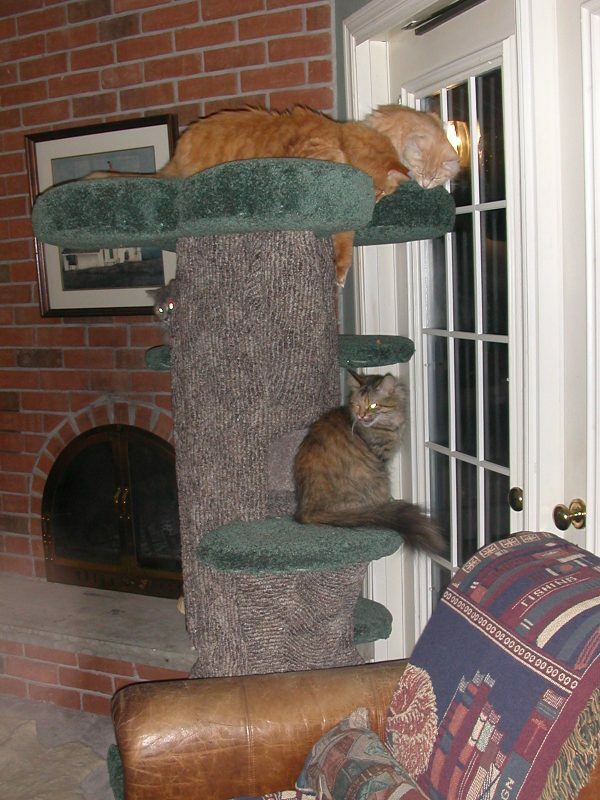 Many cats love to climb, and you can build a structure for them that is 5 or 6 feet high, with multiple platforms and levels for them to climb, jump to, scratch, and even nap on. My parents had multiple cats, and my father loves to build, so they created a six foot tall piece of art that resembles an actual tree. It has a sonotube for the center post, with holes cut out at each of the three levels for the cats to hide in and find their own zen space. Large, sturdy platforms constructed to roughly resemble boughs make great vantage points for the cats to watch the goings-on in the house, and its placement near a window ensures they aren’t missing anything out there. 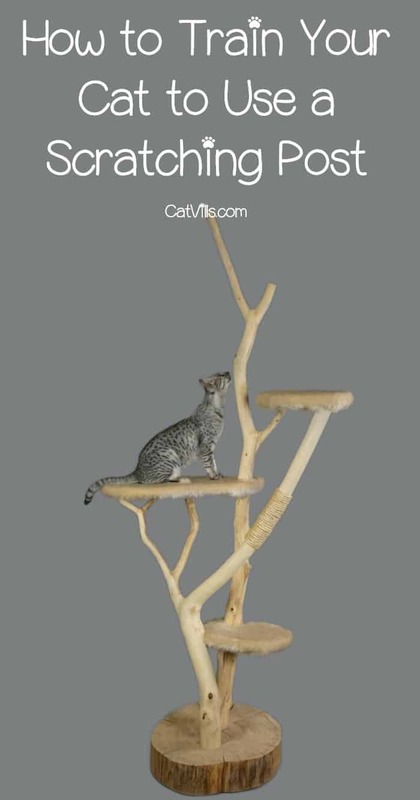 The benefit to a structure like this is that not only is it great exercise and mental stimulation for your pet, but it forces them to unintentionally use the scratching post in the mean time. While they are more costly, cat trees and playgrounds can be purchased ready-made at pet stores – or you can begin building one and add to it over time. Small, inexpensive boxes with corrugated cardboard inserts can also be purchased if money and/or space are concerns, as cats seem to like the feel of them for scratching as well. That’s all fine and well, but what if you buy or make a scratching post for your cat and they don’t use it? These three tips, used together or separately, will help. The first thing I recommend, to avoid spending any more money, is behaviour modification. If you catch your cat scratching something they shouldn’t be, pick them up immediately (but carefully) and take them to the scratching post. Gently rub their paws on the surface and praise them while you do – then praise them even more enthusiastically if they take a couple of swipes on their own. Avoid getting angry if at all possible – they are just learning, and don’t yet know the rules of the house when it comes to scratching. If you have had them a while and sprayed them with water or yelled when they have scratched, they may be associating scratching in general with punishment – and instead of happily using the scratching post, they will continue to use whatever they want – just when you’re not looking. If your cat is still resisting the post or pad, you may need to entice them. This can be done with treats or toys at the base, then on top of the post and by playing with interactive toys in a manner that brings the cat nearest or onto the post. The other tactic I would use is catnip – it can be a great tool, as it is harmless to your cat, fun for them, and great entertainment for you. It can be purchased at pet stores dried, as a spray, or as a live plant, which can be kept indoors or outdoors – but should be out of your cat’s reach if they are unsupervised. Most of all, be patient. You may have to experiment with different locations for your scratching post, and it may not happen overnight. Kittens tend to pick up on rules pretty quickly, but like toddlers, will test their limits. Adult cats, on the other hand, may be slower to learn. On the other hand, they may surprise you. Did you train your cat to use a scratching post? What methods worked best for you? Share below! I just love cats! Want to have one of my own! When I get one, I would definitely follow your tips. My friends cat has ruined all her furniture so maybe I should share this post with her.Its very useful.